The spirit of George Gurdjieff infuses "In Search of the Miraculous," a crowd-pleasing new recording released by the Irish concert promoter, Louth Contemporary Music Society. It’s not just that the image of the twentieth century Armenian-born mystic graces the album’s cover and that the recording shares its title with a seminal book about Gurdjieff’s teachings by his acolyte, the Russian philosopher P. D. Ouspensky. 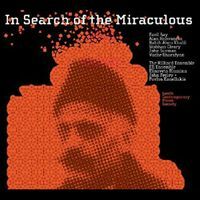 "In Search of the Miraculous"’s accessible mix of short chamber works influenced by multiple musical traditions ardently mirrors Gurdjieff’s populist, pan-global approach to spiritual teaching. Just as Gurdjieff strove to find common ground between ancient Eastern and Western modes of spiritual thought, so the recording interweaves pieces for different combinations of strings, voices, guitars and electronics composed and performed by artists who hail from such disparate global musical traditions as Armenia, Ireland, England, Lebanon, Russia, Greece and Turkey. Intriguingly, the recording’s trio of solo piano works – Black Earth by the Turkish composer Fazil Say, Chaconne by Siobhán Cleary who hails from Sligo, Ireland, and To Hiroshige’s Cat by the Armenian-American composer Alan Hovhaness – share qualities with many of the piano pieces that Gurdjieff himself co-composed with Thomas de Hartmann – namely, sparse textures, jazz harmonies and Orientalist scales. The Russian pianist Elisaveta Blumina performs these works with a Romantic yet restrained touch reminiscent of the piano playing of George Winston. "In Search of the Miraculous" is part of a long line of contemporary music endeavors such as Yo Yo Ma’s The Silk Road Project devoted to celebrating and finding points of connection between disparate musical – and spiritual – cultures. Gurdjieff certainly makes for a fitting figurehead for this type of work.